March is the month for cutting back the remaining deciduous ornamental grasses in the garden at Barn House. Only those that are robust enough to still look good in their winter finery are still standing. In this respect, it’s hard to beat cultivars of majestic miscanthus sinensis. Two-thirds of the plants for the 70 metre hedge of Miscanthus sinensis ‘Malepartus’ were sourced from Knoll Gardens, the UK’s leading ornamental grass specialist, the remaining third were obtained from divisions. The effect of a 2 metre high line of grasses racing along the boundary was achieved by planting in a staggered row at 3 plants a metre. In March, dried to a blond skeleton of its summer self, the tall stems draw the eye. Underplanting upright grasses with bands of rudbeckia is one of my favourite combinations for the flowers followed by dark seed heads. But the fading remains of miscanthus flowers are worth keeping in their own right. It seems to me, that late flowering cultivars remain fluffier throughout the long winter months while the earlier flowering ones thin to a golden filigree by March. Both capture light in the most delightful ways. As its name suggests, Miscanthus sinensis comes from ‘China’ in the broad sense that it’s widespread across eastern and south east Asia. Knowing where plants are from can be helpful, ornamental grasses are often described as ‘cool’ or ‘warm’ season growers. This distinguishes those that start into growth early or late in the year and when they subsequently flower. Miscanthus sinensis, as a warm season plant, stirs into growth slowly from mid spring as light levels and soil temperatures increase. It reaches its flowering peak in late summer or early autumn. Modern cultivars have been selected to flower well in temperate climates, given optimum conditions maximises their performance. Mostly, miscanthus sinensis prefers an open, sunny position and to be grown in moist but well drained soil. In mass plantings in my garden, where conditions vary across large areas, this can be tricky. With designs of this sort, near monocultures, it’s desirable to maintain a uniform visual effect, unhappy plants stand out like a sore thumb. In one area, the planting density of a dwarf miscanthus hedge has been increased from 3 to 5 plants per metre to compensate for the shade cast by the old apple tree. The answer might be to delete the tree …. I buy grasses in 1 or 2 litre pots, there’s rarely an option to do otherwise. 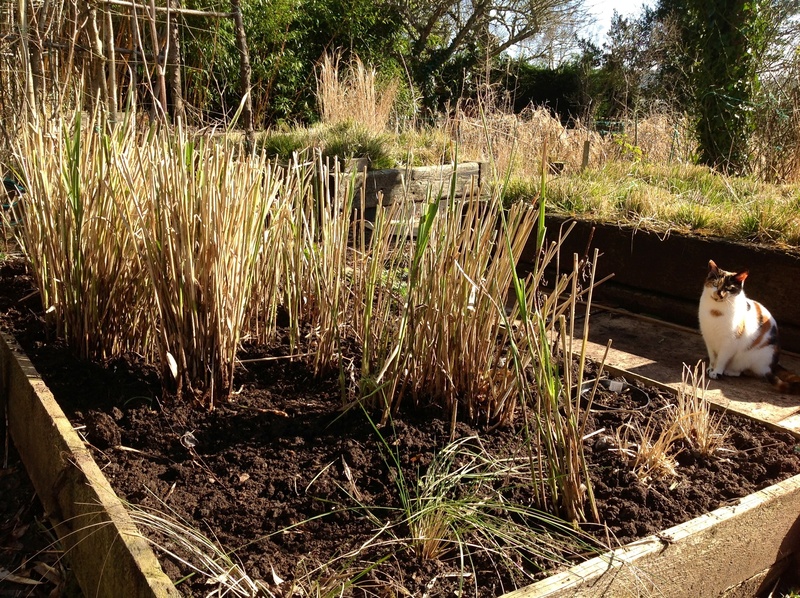 Planting miscanthus in small groups of 3 plants a metre in a mixed border allows them a little elbow room to establish themselves well. In the image above, a four year old clump of dwarf Miscanthus sinensis ‘Little Kitten’, is now more able to hold its own against the vigorous variegated vinca. Dwarf cultivars are useful for smaller areas, as accent plants, or as pot specimens. Another sound reason to space miscanthus as per the planting instructions on the pots you buy it in, and not squash it in as I’m prone to do, is that eventually a thriving specimen will more than occupy a square metre of ground. Unless divisions are the goal, lifting a mature plant in its entirety can be hard work. In raiding 3-5 year old miscanthus clumps over the last ten years, I’ve increased the stock available but, if left for a few more years, they make dramatic specimen plants. Of the many cultivars of Miscanthus sinensis here in the garden at Barn House some have attained a mature presence. Two, planted in 2011 at opposing sides of the gateway to the back garden, were grown from divisions but have since been left undisturbed. They may be a bit slow to get going, but once established, their impact spans the seasons.